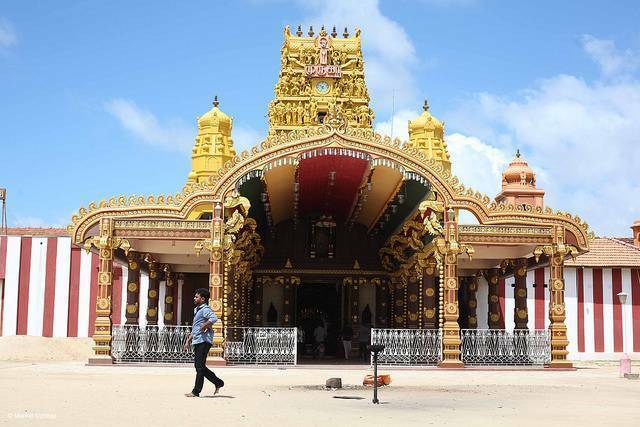 The Nallur Kandaswamy temple, standing in the town of Nallur, Jaffna is a very important Hindu temple located in Sri Lanka. This temple is dedicated to Lord Murugan (son of Lord Shiva- Karthikeya) who resides there in the form of the Holy vel. The Nallur temple is an important institution representing the Sri Lankan Tamils Hindu identity. It is towered by a golden-ochre gopuram made in the original Dravidian architectural style, located at the main entrance. Offerings in this temple are made to Lord Murugan and several other Hindu deities including Lord Ganesha which are located in the shrines surrounding the inner sanctum of the temple. It is a symbol of punctuality, order and neatness and holds such great significance for the Tamil Hindus that many other temples have been built in Europe and North America to serve as a cultural memory. The Nallur Kovil’s present structure dates back to 1734 A.D. The architecture and interiors of this temple consists of huge compounds which are decorated with intricate brass-work, huge murals adorning its many halls, and a revered holy pool. This temple is famous for its annual festival which is popular the world among, especially among the Tamil population. The Nallur temple is a very pious place and a visit to this place will help you know about the rich Tamilian culture and its various forms.